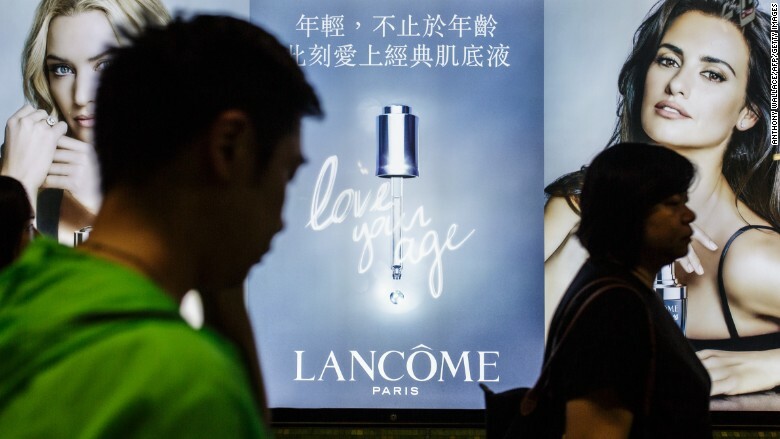 French luxury brand Lancome has been accused of ditching an outspoken celebrity from its promotional activities to please China. The cosmetics line, owned by L'Oreal (LRLCF), recently canceled a promotional concert in Hong Kong featuring popular local singer Denise Ho, who has spoken out on a range of controversial political issues concerning China. The move prompted an angry reaction from the singer and Internet users in Hong Kong. Lancome's decision came one day after the Global Times, a Chinese state media outlet, berated the brand for inviting a singer who "supports Hong Kong independence and the ringleader of Tibet independence." The Global Times also called out Listerine for using Ho as a spokeswoman. The news outlet made the comments in a post on Weibo, a microblogging service where it boasts 4.4 million followers. Beijing has a long history of trying to stamp out anti-China sentiments, with news and information heavily controlled in the country. Foreign content is frequently blocked by government censors, a system dubbed the "Great Firewall." Ho has long been vocal about her political views, participating in pro-democracy protests in Hong Kong in 2014, and also meeting with the Dalai Lama, the exiled Tibetan spiritual leader. Such moves are guaranteed to annoy the Chinese government. Lancome said it chose to cancel the Ho concert over "safety reasons," but didn't elaborate further. Ho later issued a statement challenging Lancome to explain its decision, saying that the cancellation "seriously misled the public and jeopardized my personal reputation." "When a global brand like Lancome has to kneel down to a bullying hegemony, we must face the problem seriously," she said. Lancome's Hong Kong Facebook page was deluged with thousands of comments on the matter. A boycott of Lancome's products was threatened, and a protest against L'Oreal was planned for Wednesday at an upscale department store in Hong Kong. On Listerine's Hong Kong website, meanwhile, Ho was still featured in a prominent position. Listerine said its campaign with Ho was limited to Hong Kong and would continue. -- With reporting by Vivian Kam.